The modern app needed to read/write data or files that would be shared between it and a desktop app. The modern app needed to send/receive “events” from a desktop app such that the two were in sync with one another. 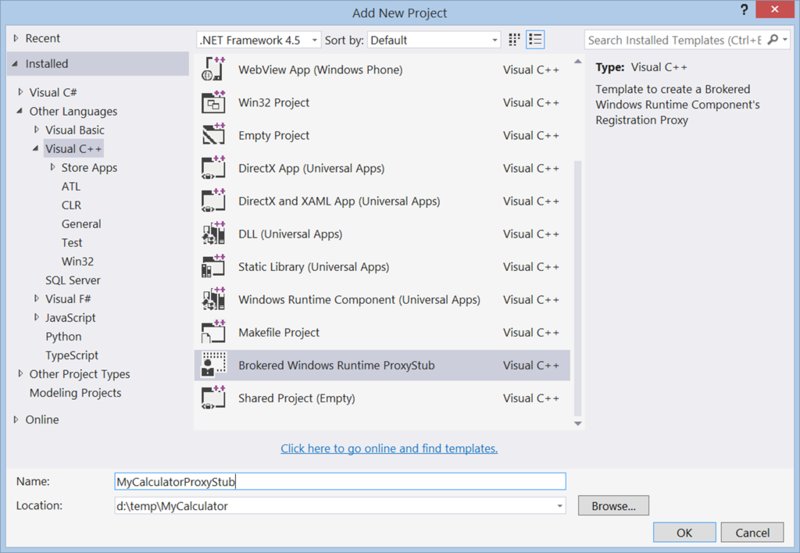 The modern app needed to call APIs beyond the WinRT APIs and the subset of .NET and “Windows” APIs that are available to a Windows Store app. e.g. this often surfaced around a modern app talking to a piece of hardware via some interface code that already existed. but there are perhaps many others. Be sold/served from the Windows Store without any dependency on an additional piece of software. 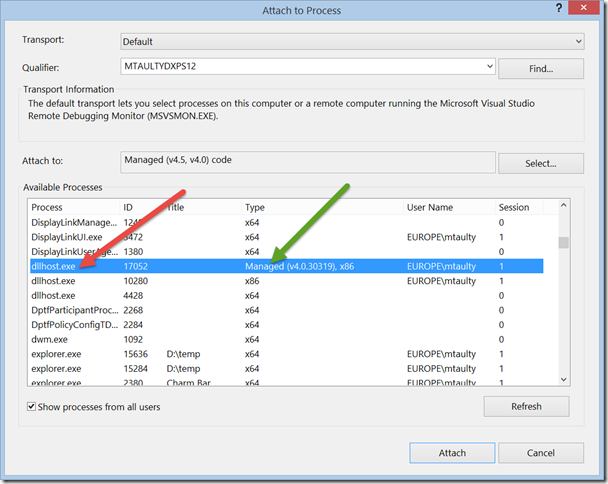 Have a lifecycle model which was incompatible with existing Windows ‘desktop’ software. Have a security model which was much more restrictive than existing Windows ‘desktop’ software. Run on hardware (specifically, ARM based systems) where Windows had never run before. and that was pretty much that until the arrival of Windows 8.1 Update with its new feature around “brokered WinRT” components. In my time, I’ve written quite a lot of COM components, some in C++, some in VB, some in .NET and so I feel like I’ve got some experience in this kind of area but my COM is increasingly rusty and I have not spent nearly so much time on the “modern COM” that came as part of Windows 8 along with IInspectable and so on and so I must admit that while that document is a really good one, I still find myself staring very hard at it and, from time to time, scratching my head. I read it more than once. 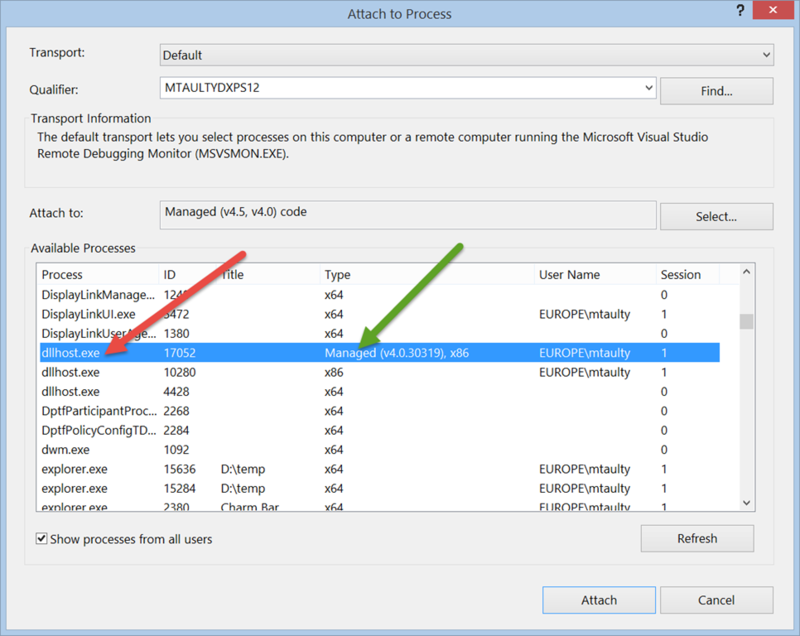 It is possible to use existing code from a Windows 8.1 Update modern app in an Enterprise side-loaded scenario. 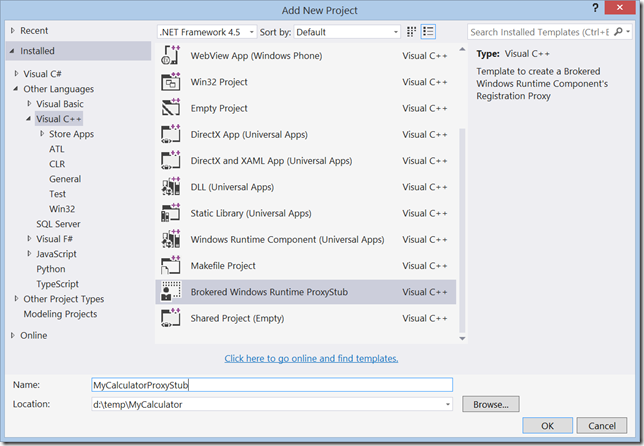 There’s a sample to explore and a Visual Studio template to be used as a basic for your own work in this area. The architecture involves running a modern app in one process and a “brokered component” in another process with IPC between the two. As always, this is going to mean “marshalling” of data between the two environments which always has an impact. As always, this involves agreeing on a type system to marshal to/from and that’s the WinRT type system here. 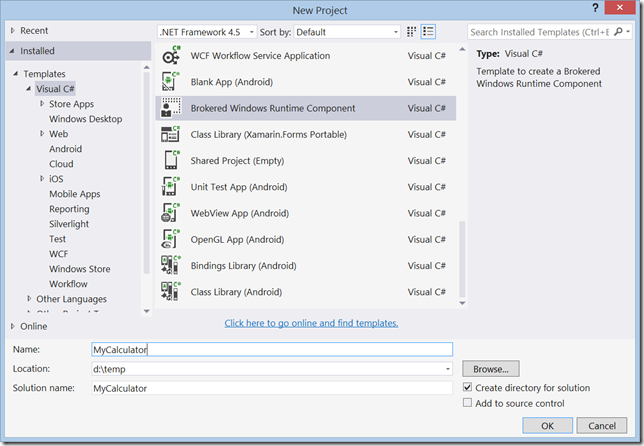 This has primarily been thought about from the point-of-view of a .NET developer on .NET 4.5. 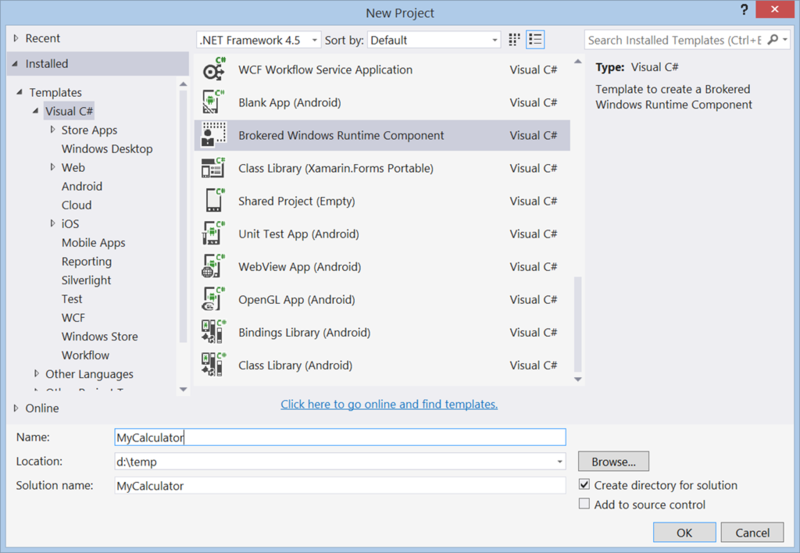 Unlike building regular WinRT components (in .NET) the process for building one of these brokered components is going to involve defining a separate .winmd file which purely defines the interface and another which implements it. At the moment, this is primarily targeting 32-bit scenarios although the “modern app” side of the equation can be 64-bit. The build scripts for the various pieces would take some analysing. The references for the desktop project would need a bit of analysing – particularly the various “facade” assemblies that are referenced. 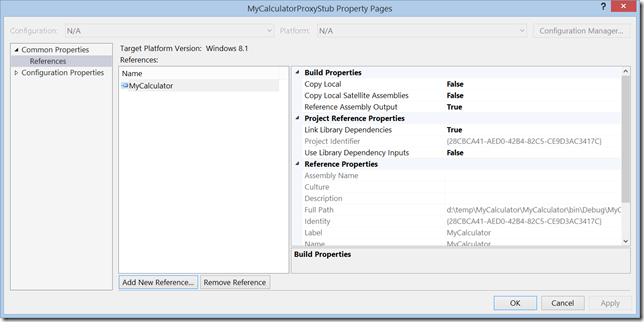 There’s a need to build/register a proxy/stub from within the application’s package. That document is really good and thorough but I must admit that at the end of my first pass through it I felt like I could do with a diagram or two showing which componentry ran in which process and where various pieces were deployed to. To help a little with understanding, I figured I’d try and get “Hello World” working via the “Brokered WinRT Component Project Templates” and then see if I could work backwards from there. The steps I followed are as below. Before running this, I took a few more steps. Then I edited the manifest file to add in the Extensions section which listed my type. Note that windows.activatableClass.inProcessServer is somewhat doc’d on MSDN. And, in as far as “Hello World” goes – I was pretty happy. My next steps would be to try and add some references to the component being used and bring in some code (e.g. ADO.NET, File System, WCF) that can’t be usually run in a Windows Store app to see what it’s like to run that code in this context. But…I must admit that I was a little bit sketchy about what I’d just actually done. I kind of “get” that it worked out but what’s going on at the point where my code news up a MyCalculator.Calculator instance? Attempt to kill any dllhost that’s using my component. 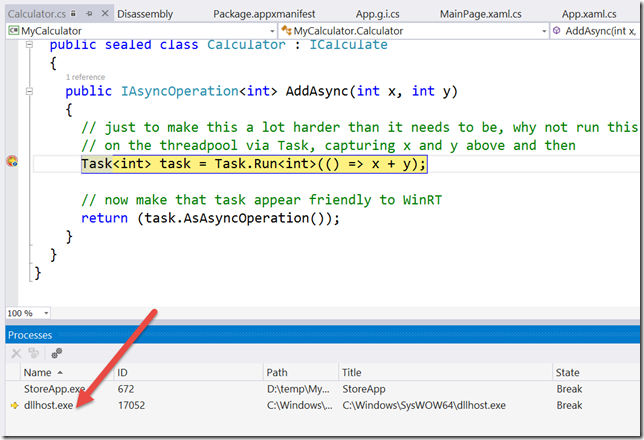 Use winmdidl and midl to tear apart from C# .winmd component and use the results to build both a proxy/stub and another .winmd that only has “interface” in it, not implementation. 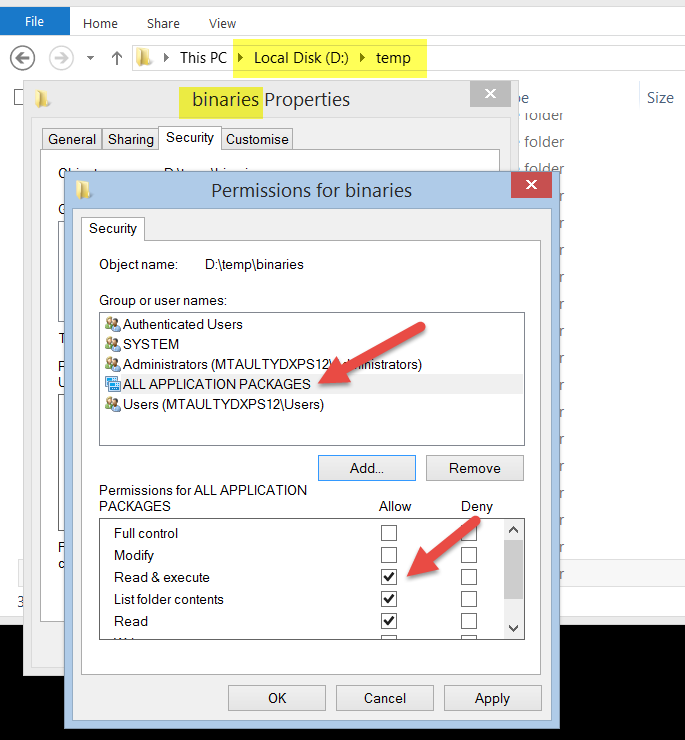 Use icacls to attempt to make sure that the output folder is accessible to the “ALL APPLICATON PACKAGES” identifier as I did manually above. 1. Run the output of the MyCalculator C# project through the winmdidl compiler to generate IDL from the binary. Because the binary is implemented in C#, it contains both interface or “shape” along with implementation. 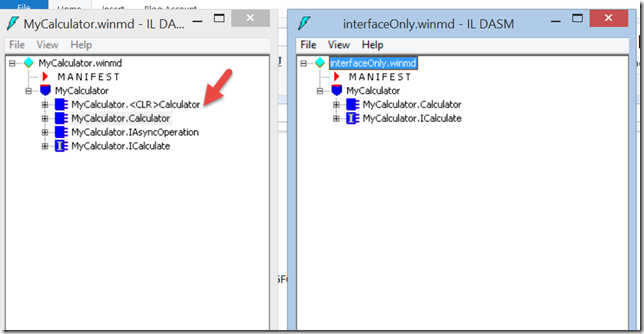 There’s now an “interface only” version of the .winmd file – the code’s been sucked out of there. As an aside, this is how a WinRT component written in C++ is always packaged. 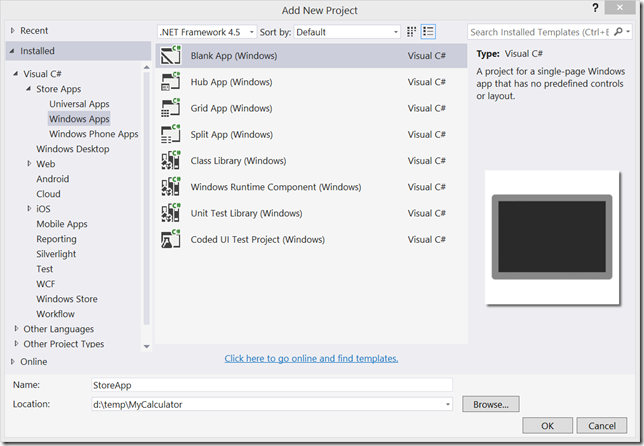 That is – you can’t embed native code into a .winmd file so a C++ WinRT component is always going to have an “interface only” .winmd file. 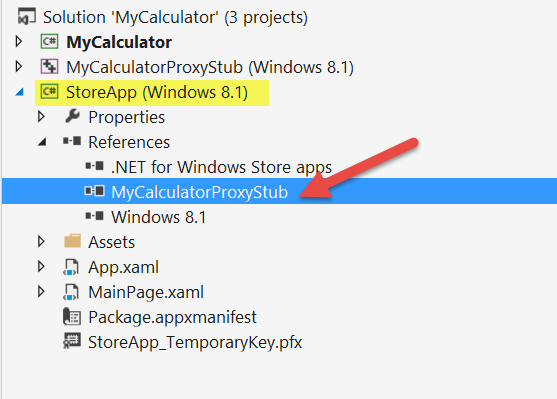 This is the .winmd file which the Store app I made above ultimately references and it’s basically a re-packaging of the .winmd file that the MyCalculator project originally produced except the implementation’s all gone and it’s a pure “interface” .winmd file at this point. So…no way that Store app is going to be running any code from inside of this file. and the project template compiles these up into a DLL with the .DEF file that I referenced earlier in the post to export the standard COM exports for registration, class objects and checking whether the DLL is still in use or not. and so the proxy/stub is in place for marshalling this interface. 3. 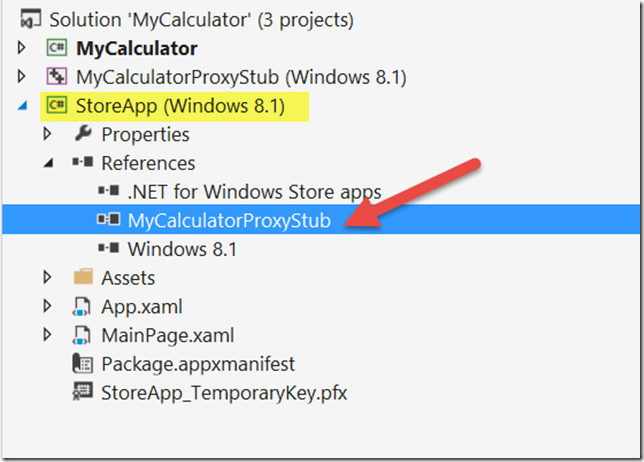 When the Store App news up a MyCalculator.Calculator instance – what happens? I get a bit vague at this point but the StoreApp is .NET code so I can disassemble StoreApp.exe with ILDASM and have a look at the manifest. In there, there’s a piece that says that there’s a reference to the MyCalculator component and this reference was formed by making a reference to the “interface only” .winmd file. I think that the windowsruntime keyword there means (via “CLR and the Windows Runtime”) that the CLR doesn’t just try and create MyCalculator instances but, instead, delegates that down to the Windows Runtime. So we know that the creation of this “type” is prepared to be delegated to something else. How does that work? In all honesty, I’ve long since forgotten a number of details about how classic COM activation worked and, worse, the details of how modern COM activation works have always been a little obscure to me. 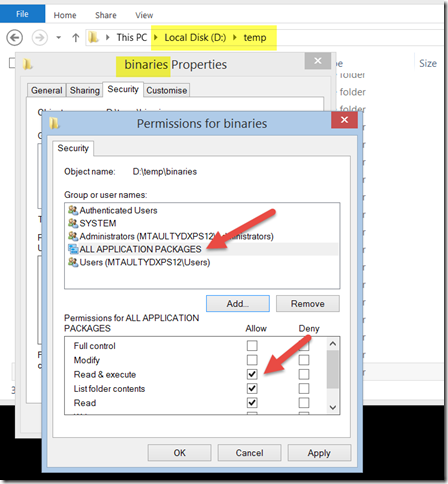 However, it’s COM so the likelihood is that the registry will help – perhaps looking at what happens to the registry during package installation might help in seeing which of the bits that I specified in my app’s manifest show up in the register and how they are used from there during activation of that Calculator type? which seem to say where the binaries have been placed. If I watch registry access from my StoreApp.exe at the point where it’s trying to instantiate the MyCalculator.Calculator class then I see the sketch of a pattern. 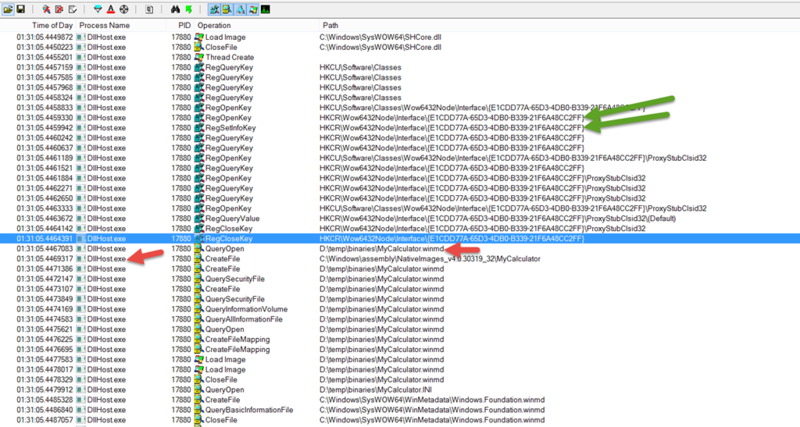 A hunt through the registry for that component then goes on and at some point the decision is made to spin up a DllHost to host a CLR-implemented COM component. It involves the usual amount of registry access you’d associate with COM. I don’t want to think about it to any greater level of detail than I’ve had to so far. And, no doubt, there’s some thought to be given here on topics like the lifetime of this “desktop” component which is going to be a reference-counted thing and how that lines up with the lifetime of the Windows Store app that’s using it which can go through its suspend/resume/terminated cycle. I’d hope to maybe have another look at this and perhaps see what it’s like to use code from that desktop component beyond adding 2 integers together and see what it’s like to do something that’s not possible inside of a Store app – like talk to a WCF service beyond the basic HTTP stack. Windows Store: App Update Certified in 41 minutes?